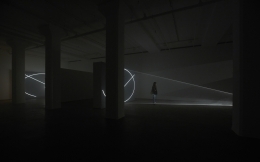 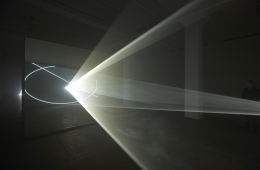 Sean Kelly is delighted to announce Split Second, Anthony McCall’s sixth solo exhibition with the gallery. 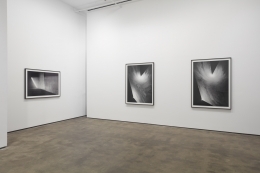 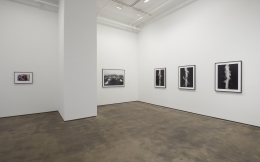 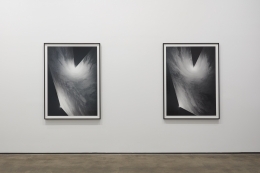 Occupying the entire space, the exhibition features two new ‘solid-light’ installations, McCall’s seminal horizontal work Doubling Back, 2003, and a curated selection of black and white photographs, a number of which will be exhibited in the US for the first time. 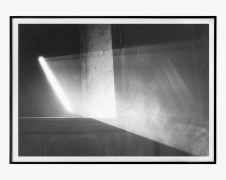 There will be an opening reception on Thursday, December 13, 6-8pm. 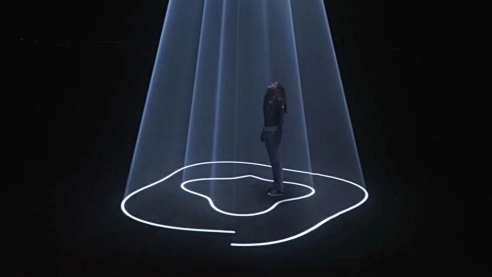 The artist will be present. 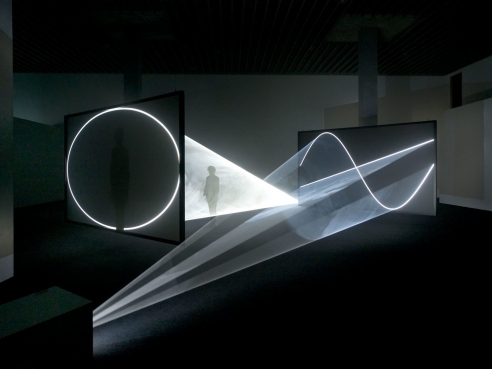 Anthony McCall is widely recognized for his ‘solid-light’ installations, a series he began in 1973 with the ground-breaking Line Describing a Cone, in which a volumetric form composed of projected light slowly evolves in three-dimensional space. 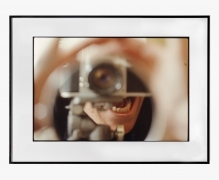 In Split Second, McCall further expands the development of this series, creating a dialogue between two new works, Split Second and Split Second (Mirror). 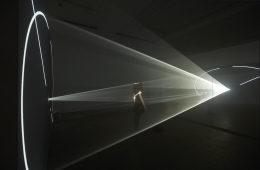 Split Second consists of two separate points of light emanating from the top and bottom of the gallery’s back wall. 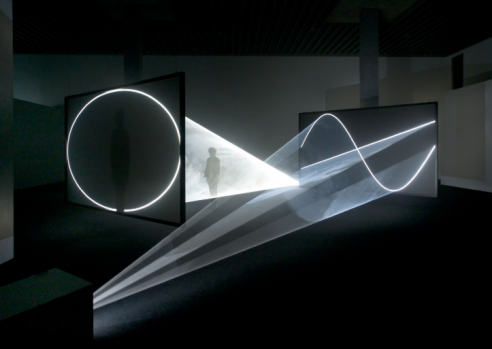 The projections expand to reveal a flat blade and an elliptical cone, which combine to create a complex field of rotating, interpenetrating planes in space. 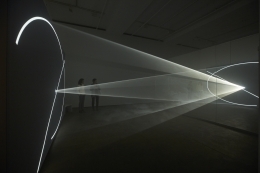 Split Second (Mirror) is a single projection in which the “split” is created by interrupting the throw of light with a wall-sized mirror. 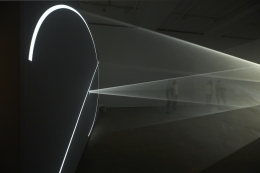 The plane of light is reflected back onto itself, creating a shifting volumetric cone, which exists seamlessly both in real space and as a reflected object. 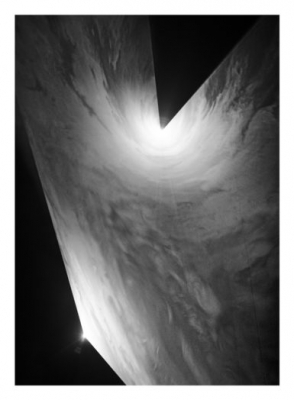 Doubling Back, 2003, first exhibited in the 2004 Whitney Biennale, is on view in the lower gallery. 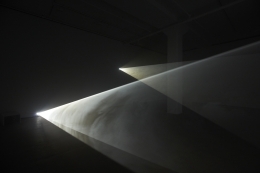 This work marked McCall’s return to making art following a more than twenty-year hiatus and was the genesis of a new series of films. 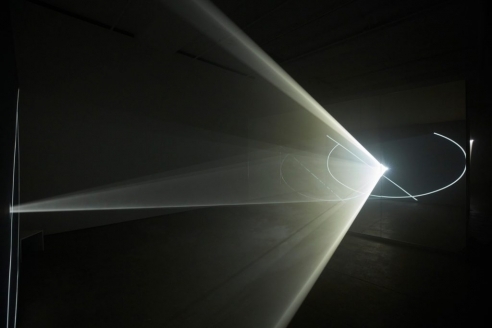 The piece is distinguished by the direct way in which it uses the architecture of the gallery as a framing device. 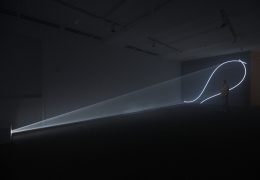 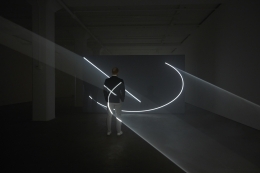 Consisting of two identical animated wave drawings, the forms intersect as they travel slowly through one another, one moving horizontally, the other vertically to produce curving chambers and pockets of light that unfold against one side of the gallery. 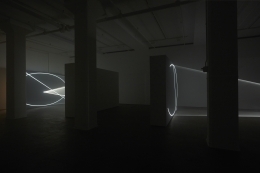 Each solid-light installation occupies a space where cinema, sculpture and drawing overlap. 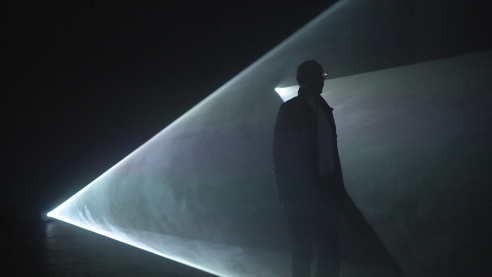 The visibility of these works is dependent upon mist produced by a haze machine, inducting the spectator into a three-dimensional field where forms gradually shift and turn over time. 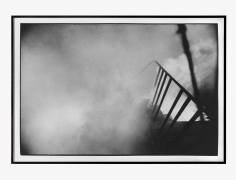 The selection of photographs in the front gallery includes images from McCall’s most recent series, Smoke Screen, 2018, which explores moments of intersection between smoke, projected light, and photography. 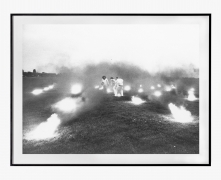 These images relate to McCall’s photographs from the early 1970s, a selection of which will also be on view. 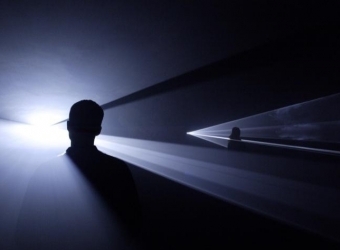 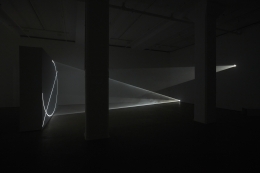 Anthony McCall lives and works in New York City. 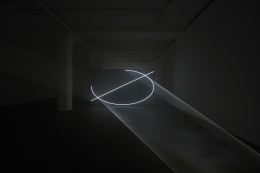 In the past year, his work has been recognized with solo exhibitions at The Hepworth Wakefield, United Kingdom, and Pioneer Works, Brooklyn, New York. 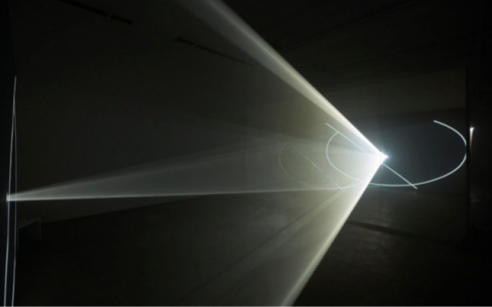 McCall’s solo exhibitions include: Serpentine Gallery, London, United Kingdom; Hamburger Bahnhof, Berlin, Germany; Hangar Bicocca, Milan, Italy; Musée de Rochechouart, Rochechouart, France; the Eye Filmmuseum, Amsterdam, The Netherlands; LAC Lugano Arte e Cultura, Lugano, Switzerland; Les Abattoirs, Toulouse, France; the Nevada Museum of Art, Reno, Nevada; Moderna Museet, Stockholm, Sweden; and Tate Britain, London, United Kingdom. 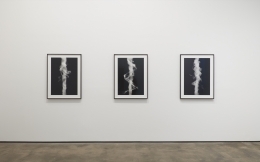 His work has been featured in group exhibitions at the Museum Moderner Kunst, Vienna, Austria; Kunsthaus Zurich, Zürich, Switzerland; Hamburger Bahnhof, Berlin, Germany, the Hirshhorn Museum, Washington, DC; the Museum of Modern Art, New York and the Whitney Museum of American Art, New York. 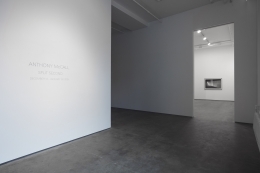 McCall’s work is represented in numerous collections including, amongst others, Tate, London, United Kingdom; the Museum of Modern Art, New York; the Museum für Moderne Kunst, Frankfurt, Germany; the Hall Art Foundation, New York; the Kramlich Collection, San Francisco, California; the Museu d’Art Contemporani de Barcelona, Spain; Art Gallery of New South Wales, Sydney, Australia; the Baltimore Museum of Art, Baltimore, Maryland; the Hirshhorn Museum and Sculpture Garden, Washington, DC; the Institut d’Art Contemporain, Villeurbanne/Rhône-Alpes, France; The Margulies Collection, Miami, Florida; the Moderna Museet, Stockholm, Sweden; the Musée National d’Art Moderne, Centre Georges Pompidou, Paris, France; the Museum für Moderne Kunst, Frankfurt, Germany; Sammlung Falckenberg Collection of Art, Hamburg, Germany; SFMoMA, San Francisco, California; Thyssen-Bornemisza Art Contemporary, Vienna, Austria; and the Whitney Museum of American Art, New York.